Need a vessel to match your home decore? 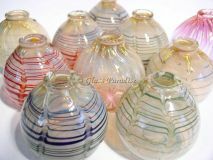 Browse our selection of unique handblown art glass diffusers. We also carry premium quality rattan reed refills for use with your fragrance oil diffuser. Ambient fragrance diffusers (aka: passive diffusers) scent your home without the fire hazards associated with burning: candles, lamp rings, or incense. Add a touch of glass to your decore with the simple elegance of our handblown reed diffusers. Just pour some of your favorite fragrance oils inside a vessel and insert the reed sticks. The oil will be absorbed by the reeds, drawn up and diffused naturally into your personal environment. Flip the reeds anytime you want to release a fresh burst of fragrance.